Kenneth Branagh has directed several celebrated film adaptations of Shakespeare's plays, but none has reached the heights of his recent Hamlet. This magnificent four-hour production is brisker (not to say far riskier) than plenty of 90-minute movies on the market. Not since Orson Welles has a director brought so much skill, intelligence and energy to the difficult task of translating Shakespeare to the screen. By the time Branagh was ready to film Hamlet, he'd played the part on stage more than 200 times. His screen version is set in late-Victorian surroundings, in a landlocked Elsinore (the exteriors were shot at Blenheim Palace, which belonged to Winston Churchill's family). Branagh's Hamlet delivers the play's customary atmosphere of doom, hauntings and betrayal, but it is still elegant, gilded and often very funny. Branagh has cultivated an easy, slangy style in interviews, realizing that he lives in a time when Shakespeare is considered boring and "swotty" (sissified), and he remains jocular about this ambitious film. Metro: How difficult is it to direct yourself? 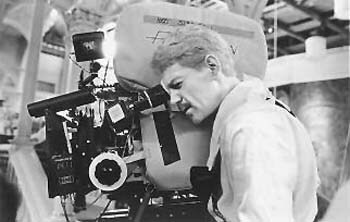 Branagh: In directing a film, you don't have any control over some crucial event occurring during the last five minutes of the day. One's grateful for the advantage of being able to film over a mistake, but when you jump in and out of character eight times during the course of a day, that's a strange way of acting. Directing the film wasn't just a situation of considering my performance. You start thinking of yourself in the third person when you watch the film. Obviously, one gets lost sometimes. The whole idea of the film is that it isn't just about one guy. He's not a solitary man whose supposed to be arbitrarily gloomy. Everything that happens to Hamlet in the play is because of other people, so it's the other performances that count. Metro: In the complete version of the play, Polonius is seen not as a prattler, but as a gray eminence, the power behind the throne. Were you tempted to add visual evidence that would prove that Polonius was in on the murder of the king of Denmark? 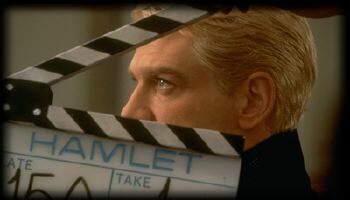 Lens Me Your Eyes: Kenneth Branagh checks a shot on the set of "Hamlet." There's support for the idea in the film, since in Elsinore there are secret doors and spy holes, and Hamlet potentially suspects blackmail through Polonius' intrusion. We certainly looked at the back story, but in the end we decided to keep the play mysterious by not making a strong interpretive statement, by suggesting lots of different things, which was our way of keeping the play traditional/contemporary. Metro: Why did you decide to set your Hamlet in the late-Victorian era? Branagh: I wanted to show the story in as late a period as the speech would make sense. We could then provide a background, an explanation of Polonius' position as prime minister. The Victorian era was a period in which royal families intermarried with arranged marriages, and in making the film in this time, we could also provide an elegant look for the women and the men. One has to consider what kind of world to create, in this case a world of opulence and corruption. People enjoy a vicarious thrill from the royal scandals, from watching the human problems of people so much under the spotlight. Metro: How would you describe your view of the character Hamlet? Branagh: Potentially a good man; potentially a great king. There isn't anything in the play to suggest that they're buried in gothic gloom or that Hamlet is a self-indulgent sad sack. He's a soldier and scholar, a renaissance man--all of these things. Metro: What do you think of Olivier's summing up of the play as a story "of a man who couldn't make up his mind." Branagh: I don't agree with that. For what its worth, he does make up his mind. There's both a deep-seated moral revulsion and a strong sense of an "eye for the eye" in Hamlet's character. More than once the question came up in rehearsal--how would you kill someone in your family? You had to choose the person you would kill and the method. The actors got very squirmy with the idea of anything physical. They all favored poison. So, there ya go--there's Hamlet's problem. It sounds like I've ducked the question. I think the play shows that he can make up his mind. He can kill in the heat of passion, and also coldly, sending off Rosencranz and Guildenstern to be killed. But the actual physical process is repugnant to him. Hamlet has a most highly developed moral sense. But, as he says, "The great can find quarrel in a straw when honor is at stake." Metro: You handled the physical side of Hamlet well. Were you an athlete as a young man? Branagh: That's the play: three hours of dialogue and then a sword fight when you're exhausted. I was pretty robust, never a sportsman, but I always enjoyed being sent for the ball. When I was doing the fight scene here between Laertes and Hamlet, I was tempted to add that bit where the sword swishes through the candles in the candelabra and all of the candles fall over. Metro: Will audiences be seeing the full-length version? Branagh: Hamlet will play everywhere in the long version, and whenever possible in 70mm, though the studio is exercising its option to cut it for airplane screenings, because otherwise the planes might have to circle the airports for another hour. There was much confusion attendant on who was going to see what where, but the agreement now is to see it in the entire length for domestic and overseas. On screen, you can do all of the things you can't do in a theater. On stage, you can't show a close-up of Gertrude to help out what is essentially an underwritten part. But the great blessing of a movie is that it will bring your performance to any place in the world.